Triumf S-400 anti air missile systems of the motorized column of the Western Military District. 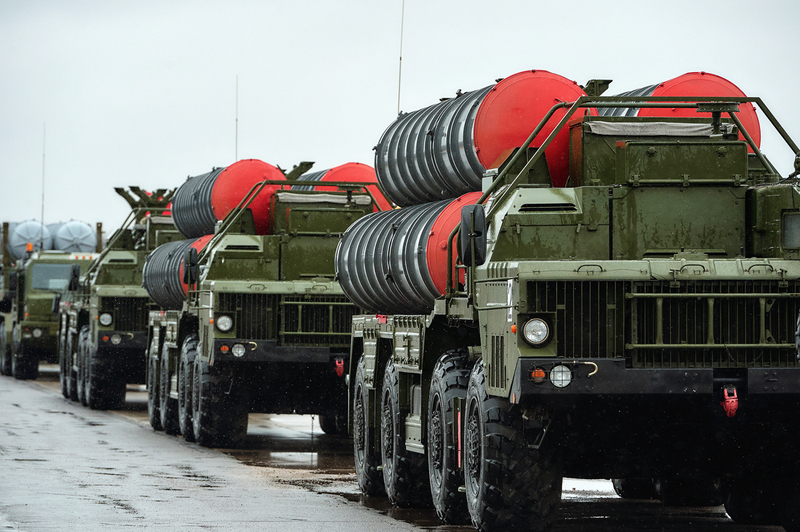 The fifth regiment armed with the S-400 Triumf missile systems has been put on combat duty in the Moscow region, the press service of the Russian Defense Ministry said in a statement. "On Tuesday, Feb. 21, another anti-aircraft regiment, armed with the S-400 Triumf missile systems, has assumed combat duty in order to provide air defense for Moscow and the Central Industrial District of Russia," the statement reads. The missile systems were delivered to the permanent deployment site from the Kapustin Yar shooting range in Russia’s southern Astrakhan region after carrying out successful live-fire exercises and being officially accepted from the manufacturer. "Now that the new regiment has been put on combat duty, the Russian Aerospace Force has a total of five antiaircraft missile regiments armed with S-400 Triumf complexes that provide air defense for Moscow and the Central Industrial District of Russia," the Defense Ministry’s statement adds. The S-400 Triumf is the most advanced long-range antiaircraft missile system that went into service in 2007. It is designed to destroy aircraft, cruise and ballistic missiles, including medium-range ones, and can also be used against ground objectives. The S-400 complex can engage targets at a distance of 400 km and at an altitude of up to 30 km.